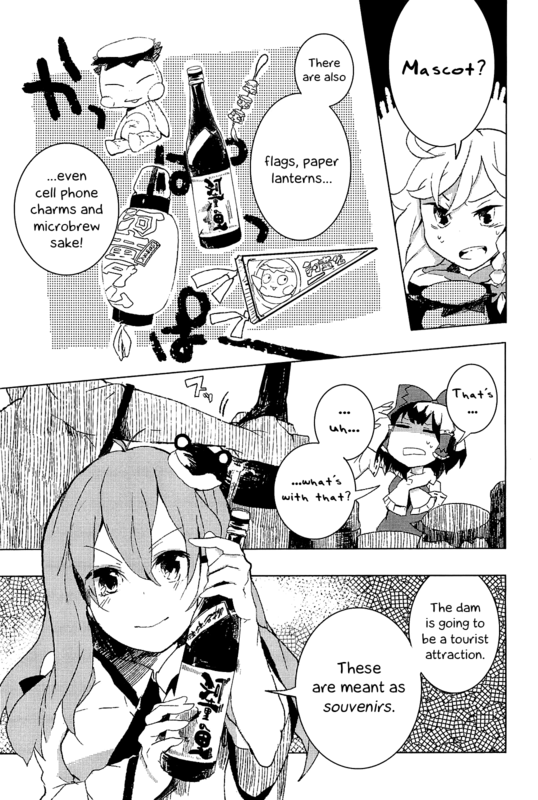 The following article pertains to a manga that is part of the Touhou Project video game series. If you’re unfamiliar with it, you should read my Touhou Project Primer first. It’s best to play the games before taking in anything else. Or Touhou Hakureimu ~ Get Rich Quick Miko. The final Touhou Project manga I’ll be discussing is Touhou Ibarakasen ~ Wild and Horned Hermit (東方茨歌仙　～ Wild and Horned Hermit). 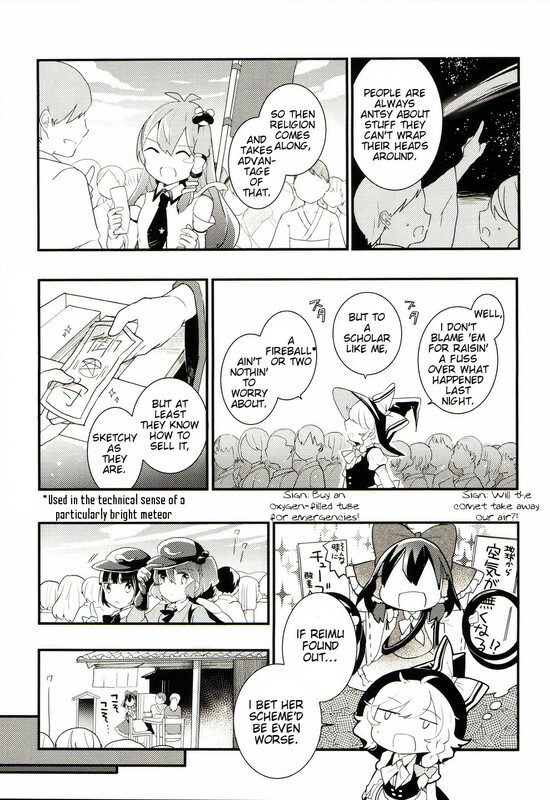 Like every other manga, this is a series set in Gensoukyou, the world of the Touhou Project video games, and is written by franchise creator ZUN. Also like every other manga, the art is handled by a different artist (for Touhou, ZUN likes to do as much as he can on his own usually — the mainline games feature his sole efforts on programming, art, music, and writing), in this case Azuma Aya (あずまあや). Touhou Ibarakasen features…Ibara Kasen, a new character, as its main protagonist. As a manga, Wild and Horned Hermit is…weird. I enjoyed it, and imagine I will continue to enjoy it, but it’s quite weird. Like Forbidden Scrollery, it has a fair amount of intrigue and dark implications, but like Touhou Sangetsusei it’s very often comedic. Really, this is a comedy manga first and an examination of a…”serious plot” a rather far second. It doesn’t exactly feel like that’s how the series will be from the start, though. There is not much to say to explain this manga. The basics: Gensoukyou is a mysterious and olden fantastical land in Japan separated from the Outside World (our world) by a barrier. It is filled with youkai (monsters) and other magical creatures, but has very few humans. Sitting on the barrier is the Hakurei Shrine, where the Hakurei Shrine Maiden works to maintain the barrier and protect the peace of Gensoukyou. 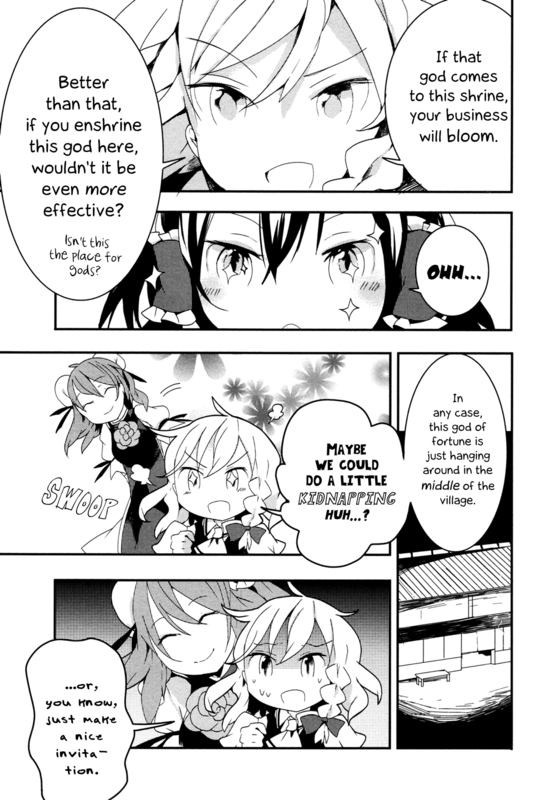 The manga begins with the shrine maiden, Reimu Hakurei, and her best friend (and deuteragonist of the franchise) “ordinary magician” Marisa Kirisame meeting at the shrine, which happens almost every day. It also begins with a very different, very sketchy/loose art style that only lasts until about chapter 5. They’re discussing something weird Reimu got, and Reimu starts planning how to use it. We’ll come back to that. This is Kasen Ibara, conspicuously also titled Kasen Ibaraki when introduced — a name she never gives to anyone in the series so far. Also, her two names are written differently in Japanese (茨華仙 for Ibara Kasen, and 茨木華扇 for Ibaraki Kasen). She came to the shrine to see the thing Reimu got, which Reimu decided to display at the shrine to entice visitors — a “kappa’s arm” in a box. 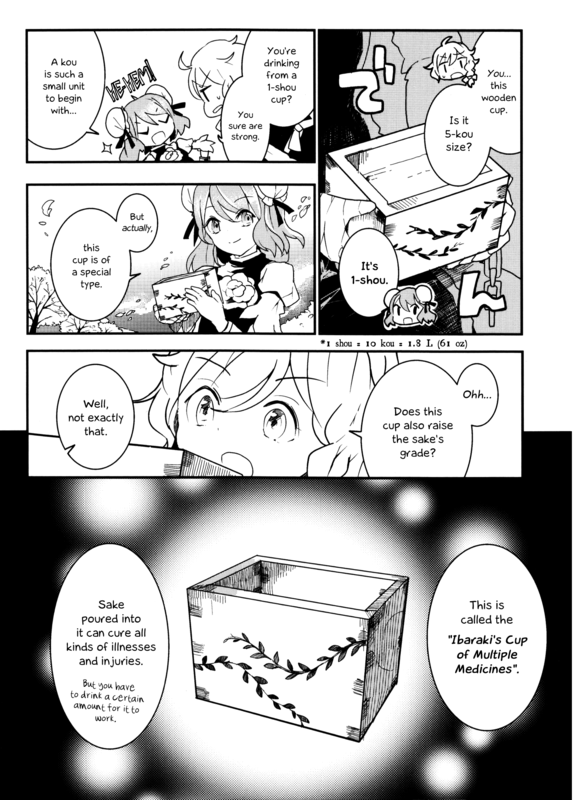 This is the page where it’s made clear this is more comedy than “drama”, since Kasen here was introduced earlier in the chapter as a serious, mysterious woman. Anyway, with that I can say what this series is really about. 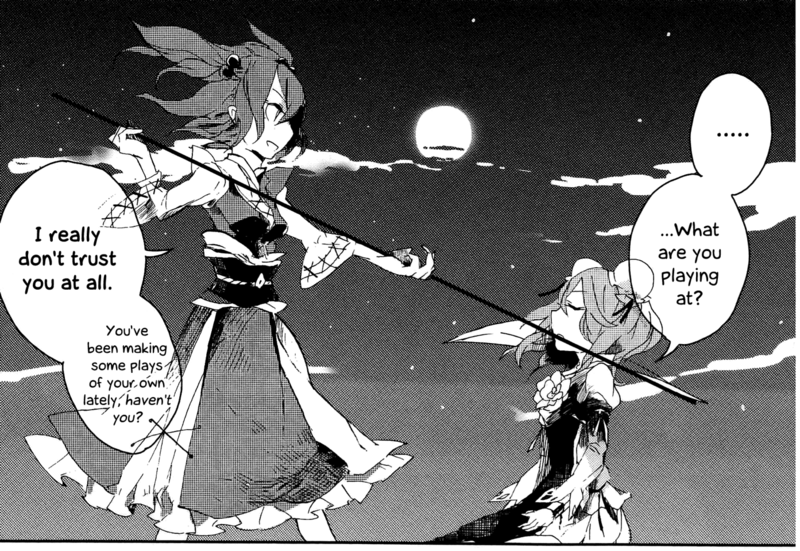 This manga is about the “hermit”, Ibaraki Kasen, who Marisa and Reimu have met in the past. 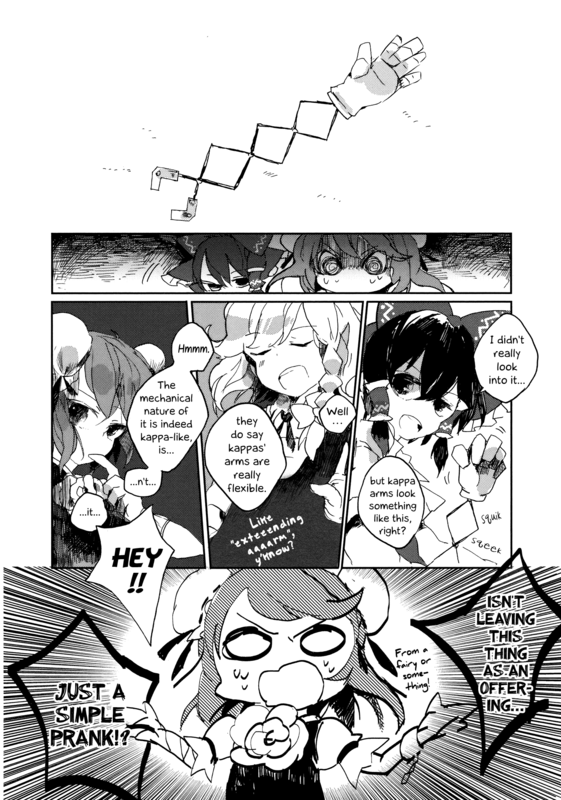 She recently has decided to breeze through town and right the slacking morals of the two Touhou heroines — Marisa who is reckless and a thief, and Reimu who is simplistic and easily loses sight of her goals (or tries to achieve goals through irreputable means) — mainly via nagging and lecturing. 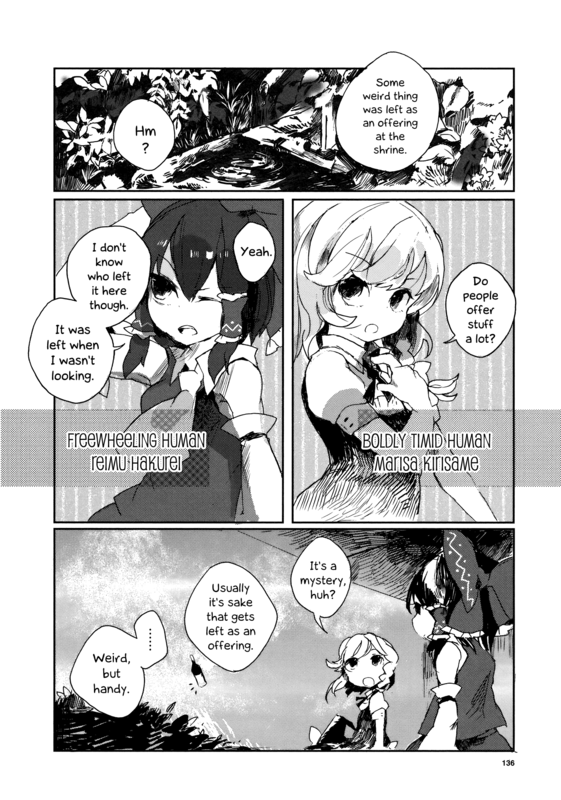 More importantly than what Kasen says she intends to do is that it’s obvious as hell Kasen is not a hermit. In fact, she’s an oni. She also possesses mysterious power she prefers to hide. Hermits in Touhou keep to themselves, as the name suggests, and are very selfish/self-centered (though that’s not an inherently bad thing, per se). They don’t necessarily care about helping others like Kasen does, they just might if people come to them. What’s more, over time it becomes increasingly obvious that while Kasen upholds some tenets and abilities of hermitage, she’s clearly uninformed on a lot of them (as well as quite a few facts about Gensoukyou in the first place). On the other hand, oni in Touhou all have shackles (which she has on her left arm), carry a unique vessel for drinking sake (which she does), and have horns (she is the “horned” hermit, and those “hair” buns are suspicious). Oni don’t need to be hermits, since hermits’ primary goal is immortality and oni are as far as we know nigh ageless. Oni are essentially like absurdly powerful, fun-loving, honorable demons that hold contests with humans, drink a whole lot, and despise a liar. Rambunctious, loud things, Kasen doesn’t seem to act like one at all, instead being very calm and seemingly trying to look “human”. She even lies — quite often, in fact. She’s clearly an oni, though — even closely acquainted with the two oni we know of in Touhou and bearing the name of an infamous oni of myth, Ibaraki-douji. For that matter, Ibuki and Hoshiguma (surnames of the two oni we’ve met in Touhou), are names of legendary oni Ibaraki-douji went along with, Ibuki-douji and Hoshikuma-douji. For these and many other reasons, her farce is easy to see through. Not that most characters seem to have noticed or called her out on it (several details are only known to the reader, to be fair). One (and the best) of Touhou’s oni. 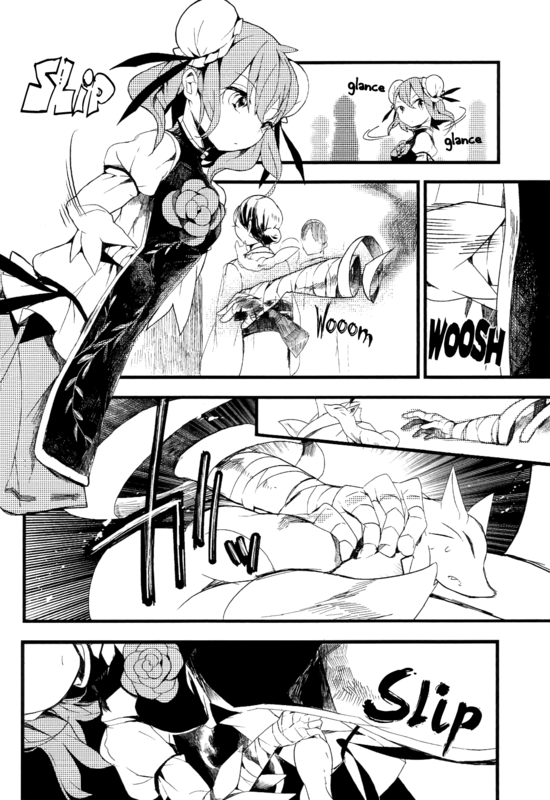 Kasen’s hiding and lies may have something to do with the fact that she’s missing an arm, and has temporarily replaced it with a bandaged “arm” made of smoke that can do weird things and easily be dispersed. We don’t know, however. 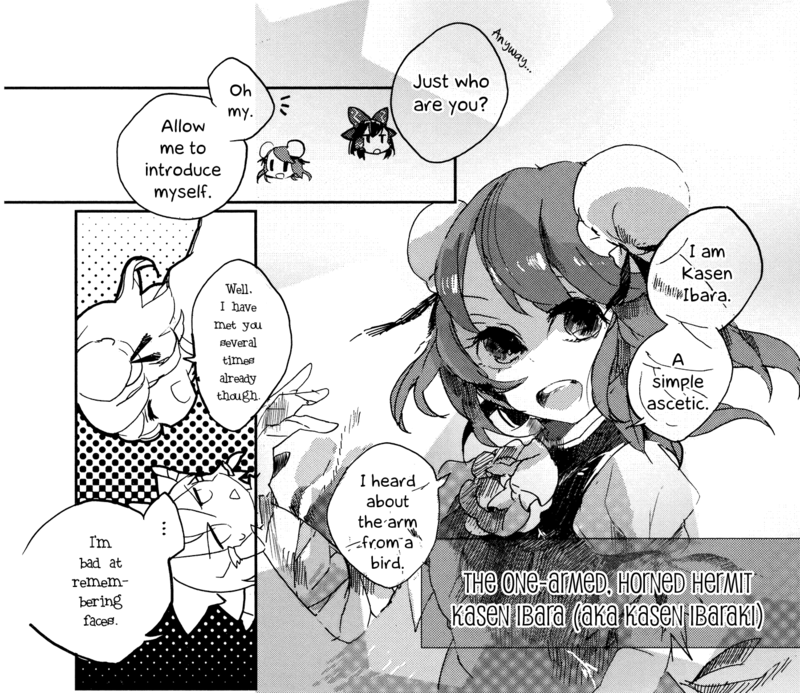 In regards to Kasen, the question is not “what are you (doing)?” but “why are you?”, since there are many obvious things about her — she’s an oni posing as a hermit, she’s looking for her arm, she has lots of animal friends that she seems to be raising (taking especial care with legendary creatures), she wants to get closer to humans, and she has a variety of other goals/activities — but her motivations are not clear at all. So, why? That’s the question you ask while reading, and as of yet we hold no answers. On one hand, I like this because it overall makes Kasen very interesting — it’s easy to want to know more about her and have that question answered. It’s particularly interesting because oni used to be prevalent and very important in Gensoukyou, but they left a long time ago and were forgotten. Only recently has the oni Suika Ibuki come around (seemingly because she’s bored out of her drunken mind), but we don’t know all the details surrounding any of them — not even necessarily where most of them have gone. On the other hand…actually, I’ll save that for the end. Okay, here’s what Touhou Ibarakasen ~ Wild and Horned Hermit is really about 90% of the time: Reimu Hakurei, the so-called “Wonderful Shrine Maiden of Paradise”, desperately trying to make the Hakurei Shrine more popular and profitable. However, Reimu is very honest and not a schemer at all, so this pretty much never works out well. It’s usually Kasen who pulls her out of it or rescues her before things get too bad. Marisa doesn’t help. Marisa often makes things worse. You should know, this happens in pretty much every single part of Touhou you can think of, but it’s the biggest focus here. After all, the Hakurei Shrine…it has problems. “The Hakurei Shrine. A dilapidated shrine on the eastern border of Gensokyo. It’s always bustling with non-human activity, as if it were a shelter for itinerant youkai. Reimu is a girl who treats everyone about the same (essentially with mild to severe annoyance), but in so doing she pretty much treats monstrous youkai (which it’s her job to beat up) like equals to humans. The enemies she and Marisa triumph over in the games love to hang out at her shrine, and she doesn’t tend to deny them all that seriously, usually having a good time drinking with them. Her shrine was never in a good state, but with all the youkai palling around her place it’s not any better at all. 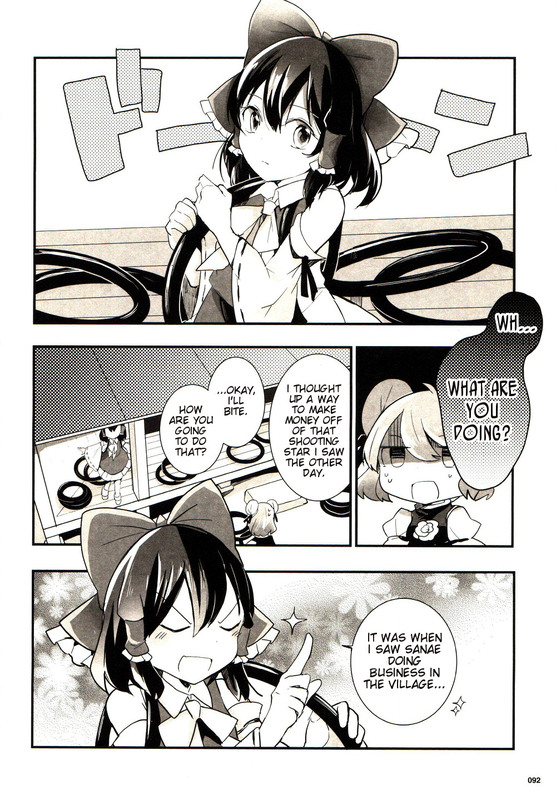 So, honest Reimu often tries to drum up interest in her shrine and remind people that it’s a shrine for humans. But with that honesty and a complete lack of business sense, her plans are usually terrible, lazily thrown-together scams that have a tendency to do more harm than good. The only 100% successful shrine event that comes to my mind with Reimu that she actually came up with herself didn’t even come from Wild and Horned Hermit, and the main attraction was a youkai. A shrine maiden with business sense. Sanae Kochiya, a girl from the outside world, is a shrine maiden from a shrine that pretty much bullied its way into Gensoukyou in one of the games. Oddly, she hangs out with Reimu fairly often in this series, although she doesn’t really do that in anything else (it would be inconvenient, I suppose, since Sanae’s shrine is far away on a mountain). She doesn’t actually appear enough to be a fourth main character, I think, but I figured I’d mention her anyway. Her shrine, the Moriya Shrine, is much more enterprising and much better handled than the Hakurei Shrine, though the two aren’t rivals. In fact, the Hakurei Shrine has a small branch Moriya Shrine on its grounds. Sanae is a sweet, excitable, but somewhat naive girl who isn’t completely used to Gensoukyou yet, though she’s trying. And there you have it, I think that’s all I have to say. 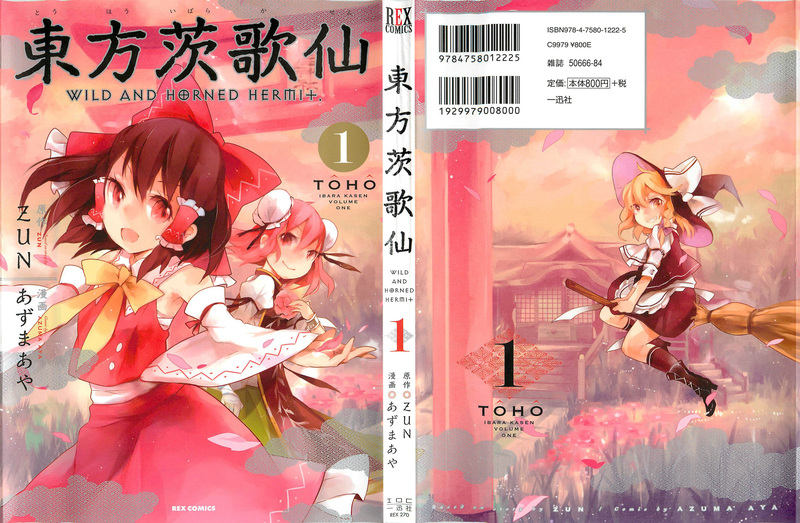 This manga can probably be enjoyed by you if you don’t know anything about Touhou because of the comedy focus (although, it’s FULL of references and cameos, much more than the other manga, so you’ll be missing a lot), but whether you’re a fan or not I have one recommendation: don’t read this series all at once. The chapters aren’t huge (about 30 pages each), but they feel rather long, and things do not flow entirely smoothly from chapter to chapter. This isn’t actually a criticism, though. 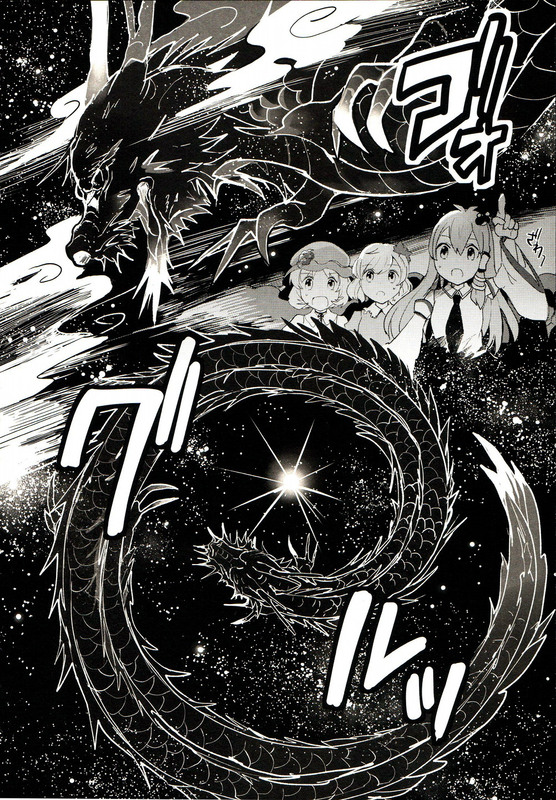 Wild and Horned Hermit is released bimonthly, meaning it is quite a while before a new chapter comes out. Like Touhou Sangetsusei, which took/takes a similar amount of time between chapters, Wild and Horned Hermit is a mostly unserious comedy so that, when you come into a chapter after not reading it for a while, it isn’t jarring. However, because it isn’t as lighthearted as the Three Fairies manga, reading the entire thing in marathon isn’t easy. I would recommend reading this one volume at a time instead of start to finish. You may experience a feeling like burnout otherwise. I enjoyed reading this manga, but I really feel like I would have enjoyed it more if I’d spread it out. Ah, and I can’t leave this off without touching on the art! It’s good! Very “cute” and “funny”. Azuma seems to have a good sense of humor when transcribing ZUN’s scripts, and her art in general is very nice to look at. I wasn’t a huge fan of the first few chapters in style, since it was too “airy” and…hm, “artistic”, but she focused down pretty quickly. …Oh right, I said I’d bring up “the other hand” at the end. Right, this series is definitely not without flaws. In regards to Kasen Ibaraki’s mystery and intrigue, like I said on the one hand it’s very interesting and enticing. On the other hand, being teased for this long is honestly somewhat irritating without resolution. Kasen even appeared as a playable (and very important) character in the fighting game “Touhou 14.5: Touhou Shinpiroku ~ Urban Legend in Limbo” but nothing about her is actually resolved there (though it’s interesting for her character nonetheless). Furthermore, although Wild and Horned Hermit is kind of front loaded with “serious” scenes featuring Kasen, these become very scarce over time. 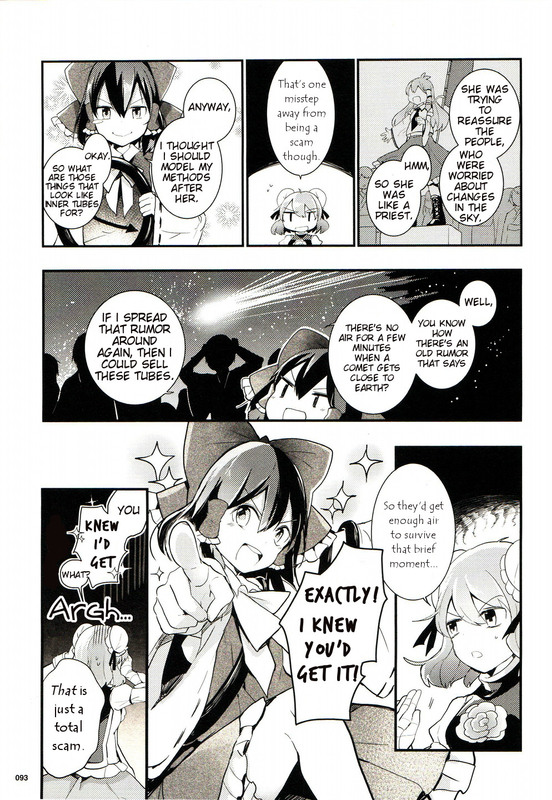 As I said, Touhou Ibarakasen is a comedy manga first. Although I said to take your time with this series, at the same time that may be a double-edged sword. If you were to, say, read it similar to how it was released (every two months), you’d be spending years on the series and still not see why Kasen is raising dragons, or why Kasen is missing an arm, or why Kasen is doing anything at all, which could be severely detrimental to your enjoyment. Personally, I have found most of my pleasure derived from this manga to be a result of Reimu’s antics, but Kasen’s mysterious character has undeniably left me frustrated at several points. ZUN has made recent statements suggesting Wild and Horned Hermit will soon be going through big changes, and I can only hope that means he’ll be making good on some of the promises of this manga’s premise.